Heartless resembling a fish that calmly swim the seas. They are often carrying Screwdivers. Leisurely large creatures that do not attack unless provoked. A fish-like Heartless that lazily wanders the sea. The Aquatank attacks with Thunder or by whirling its sizable body about. Automatically reload cards when they run out. The Aquatank is an Emblem Heartless found in Kingdom Hearts and Kingdom Hearts Chain of Memories. It is an immense angler fish-like Heartless that forms a symbiotic relationship with Screwdivers. 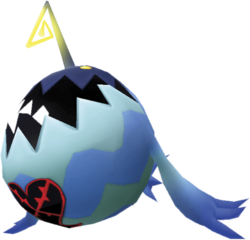 Aquatanks are very large Heartless with jagged jawlines and bright yellow eyes, albeit awkwardly placed on top of their balloon-shaped bodies. The bodies' jagged-stripe pattern in alternating light blue and turquoise echo the jaw, and the sharp dorsal and tail fins are also rather pointy, though more curved in nature. The pectoral fins, which gradate from turquoise near the body to a dark blue at the tips, are long and end in sharp claws. The top of the head is a dark navy blue and from it sprouts a glowing yellow lure, similar to anglerfish, save that it ends in a spiral. The Kingdom Hearts Final Mix changes the Aquatank's colors to purples, whites, and navy blues, and the lure showing up with a greenish-tint due to the yellow light at the end. The Aquatank's name is a reference to water; "Aqua" being the Latin translation, and a tank, highlighting its large size and power. The latter part of the name could also be a reference to a storage tank, highlighting the Heartless's size, shape, and its nature of carrying other Heartless. An Aquatank, like a Sheltering Zone, is docile during battle unless disturbed. When disturbed, it unleashes powerful attacks similar to a Large Body. An Aquatank will always appear with three Screwdivers holding onto it (unless the maximum number of enemies on-screen is reached as the Aquatank appears, causing the Aquatank to spawn alone). When its antenna glows, it unleashes a strong lightning attack that will heal all Screwdivers in the area. Avoid using Thunder spells as it absorbs Thunder. Aquatanks will attack without provocation and their attacks are usually used with powerful cards (around 6). 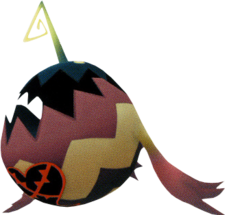 Although Aquatanks attack without provocation, they will not readily attack Sora as much as other Heartless. Unlike in Kingdom Hearts, Aquatanks will appear without Screwdivers attached to them.